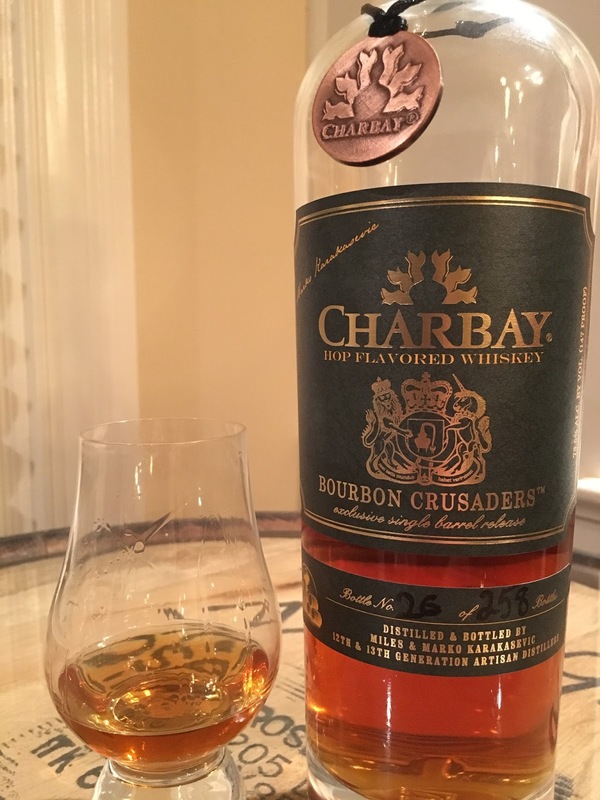 I’m veering away from Bourbon again for something out of the ordinary – a Charbay whiskey distilled from multiple craft beers. Because inclusion of hops in the beer make this whiskey more than “an alcoholic distillate from a fermented mash of grain,” 27 C.F.R. § 5.22(b), federal law requires it to be labeled as “hop flavored whiskey.” That might be a little confusing or misleading though, because there are no flavoring additives in this Charbay. All of the flavors come from the distillate and aging. 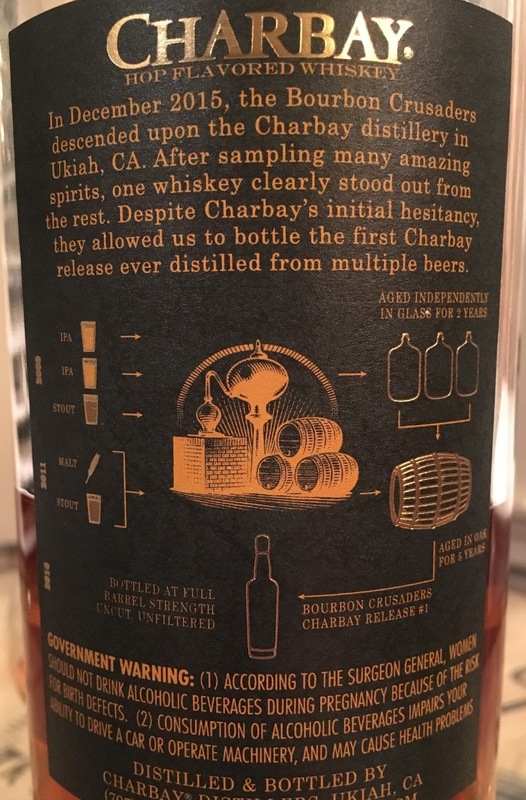 This particular Charbay has numerous components, ranging from Hop Rod Rye Beer, Red Rocket, Racer 5 IPA, and Big Bear Black Stout, all distilled in 2009, to more Big Bear Black Stout and Two-Row Malt Whiskey distilled in 2011, all blended and aged in a Missouri White Oak barrel with #3 char. Bottled at a whopping 73.5% ABV (barrel proof), it was not chill-filtered and again, it has no added flavoring or coloring. A pleasant amber, with absolutely no relevance or way of warning you about the forthcoming experience. Don’t inhale too vigorously; the high proof is evident. After some air and adjustment to the high proof, oak comes through, but mostly fragrant hops, grapefruit, and black licorice. Hops! While still noticeably hot, I’ve had other whiskies that taste like they’re higher proof, and this Charbay is drinkable neat. There are more flavors going on here than any whiskey that I can recall, from the dominant grapefruit and other citrus like orange zest, to sweetness of tootsie rolls and almond snickers, to roundness of cola and rich coffee, all layered over a base of hops and herbal flavors. What a wild ride! The finish is the least hot part of the experience, but it’s long with a balance of citrus and oak. “Unique” is too obvious. “Complex” doesn’t do it justice. “Exotic” is an understatement. The best that I can offer is an analogy. If I were to classify most of the whiskey that I drink as a type of vehicle, many would be new, powerful pickup trucks, and some would be elegant sedans, but there haven’t been many sports cars (maybe a muscle car or two, though). In contrast, this Charbay isn’t just a sports car; it’s a Ferrari doing hairpin turns through the mountains. This is a glorious ride that you need to experience for yourself, however you’re able to find a bottle or a sample. Personally, there’s no doubt that I’m sticking to my Bourbon for the long-term, but the ride was worth it. *checks piggy bank, finds a few hundred dollars but no good luck* damn. I thought it tasted mostly like soap. Tasty soap. But…soap. Good point — I hear this is avaialble at Jack Rose and Hard Water, if you don't end up knowning somebody who gets a bottle. “Tasty Soap.” I will be on the lookout for that on re-tasting. Thanks and Cheers!